TOM Clover Racing is the up and coming training business launched at the end of 2016 by Tom and his wife Jackie. Tom and Jackie both bring expertise, experience and enthusiasm to their enterprise which is based in Newmarket – the historic home of horseracing. Tom has enjoyed a successful first season with the highlight being Hunni’s victory in the £40,000 EBF Fillies’ Nursery at Newmarket. He also sent out Windsor novice winner Declarationoflove to finish second in the Weatherbys Super Sprint and the son of Declaration Of War also ran with credit at Royal Ascot. His team has amassed prize money of close to £120,000 in their first season and are looking forward to building on this solid start in 2018. Tom – and his family – have been around horses most of their lives. He rode in point-to-points as a young man and, after gaining a diploma from the Royal Agricultural College in Cirencester, started out as a pupil assistant with jumps trainer Charlie Longsdon. Tom soon stepped up to assistant trainer as the operation doubled in size. 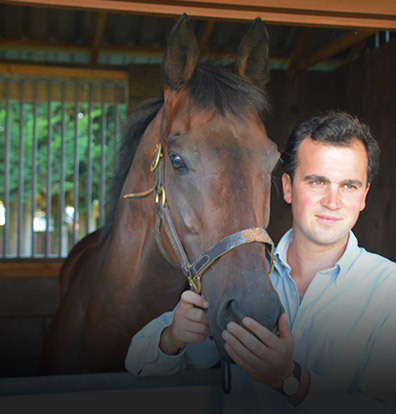 With a desire to develop his skills, he came to trainer David Simcock’s stable in Newmarket. What was meant to be a one-summer placement extended into five seasons as assistant in which Tom extensively learnt from David, who is renowned for maximising each horse’s potential. That stint has proved the ideal grounding for launching his business with Jackie, who herself grew up in one of the most famous stables in Newmarket – Kremlin House. Her father Michael Jarvis won the Prix de l’Arc de Triomphe, the 1,000 Guineas and the Oaks among many other top prizes in the sport as Jackie witnessed first-hand all the ingredients that are required to sustain a first-class training operation. In the latter stages of Michael’s illustrious career, Jackie played her part, riding out and helping in the office. These are roles she has continued at Kremlin as Roger Varian has become one of the biggest training businesses in British racing. Jackie has also significant knowledge of the business side of the sport, having been responsible for website development and many PR initiatives at Roger’s.